If you’re looking for kids wall decorating ideas to infuse some personality into your little ones’ bedrooms, you’ve come to the right place. No matter what type of design you’re seeking, you’ll find kids wall decorating ideas sure to inspire big dreams. Rest assured, these wall designs for kids rooms are fun, budget-friendly and stylish, so you don’t have to compromise on quality. Whether it’s a starry night they’re seeking, or fun girly-girl flair, you’re sure to find inspiration for boys, girls and all age groups with this array of ideas. That time you’re expecting a new life into the world is special, and part of the joy is creating a space for your infant that’s as imaginative and homey as possible. Don’t hold back on vibrant colors and whimsical themes. Dive below the surface to give your nursery wall decor an exciting — yet relaxing — splash of cool ocean blue. These underwater creatures are sure to add colorful life and flair into any nursery. Place the canvas art for kids rooms side-by-side, or play with spacing and angles to achieve your desired look. Beautify your little one’s room with a cascading array of the moon and stars. It’s perfect for girls and boys room wall decor. Many craft supply stores sell an additive to paint that makes it glow in the dark at night, while looking normal during the day as it absorbs light. Painting a starscape on the ceiling is the perfect nightlight for a nursery. Not only that, but it helps maintain a dim glow when you need to check on them at night. No stubbing your toe or tripping on a toy. If you’re not on board painting, then opt for some glow-in-the-dark kids room wall decals. What could be more perfect to accompany the glowing stars than wall art that celebrates restful, dreamy sleep? Having a forest backdrop is very common for nurseries, as it evokes a calming aura—plus, trees are a comforting element that signifies growth and development. 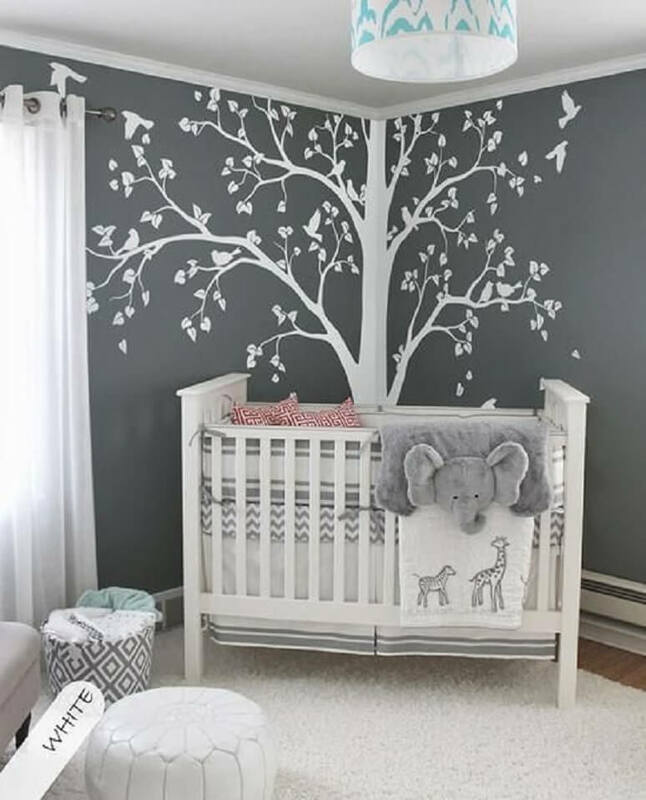 By using vinyl stickers or decals, you can instantly transform your nursery into a forested sanctuary. Having your kid’s name above the crib (or somewhere in the room) solidifies it as their personal space—even if they don’t yet realize it. Plus, it’s also a stylish focal point when entering the nursery. Play around with textures, colors and font for limitless options to make it magical. 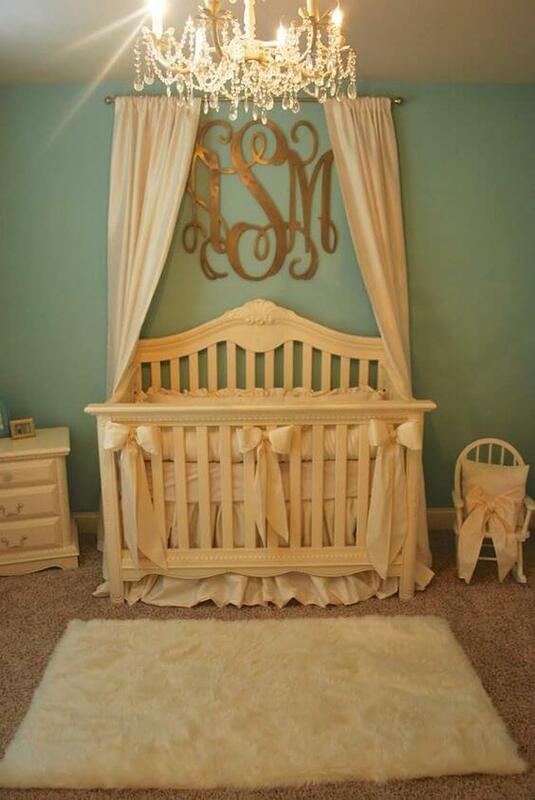 Drapery can add an upscale, classy look to your nursery that’s delicately sweet. So, your baby’s now walking and the reign of terror on your home has begun. How do you decorate a space when the primary objective of your little one is to experiment? By channeling that creativity into something productive, of course. Girls room wall decor can be brilliantly bold, and full of girly-girl excitement. After all, they’re toddlers, and the sky’s the limit. If her favorite color is pink, take hold of that, and don’t be afraid to hang up vibrant art that reflects her taste. 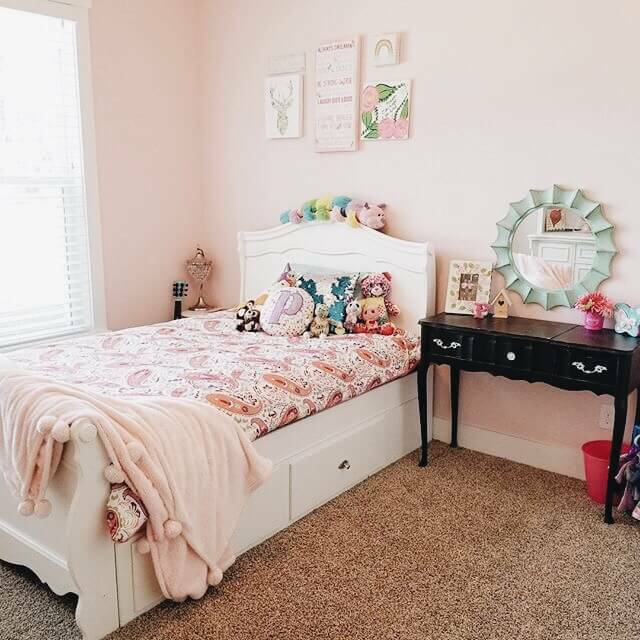 Check out our room tour with Carson for more inspiration for toddlers and young girls. Watching them grow is so much fun. Instead of marking your wall, growth chart wall decals in a kid’s room give them a way to measure and track every new inch. Plus, because you can save the decals, it can be a memory to treasure long after they’ve grown tall and that room is painted. One thing’s for sure—this chart will show you they definitely grow up too fast. 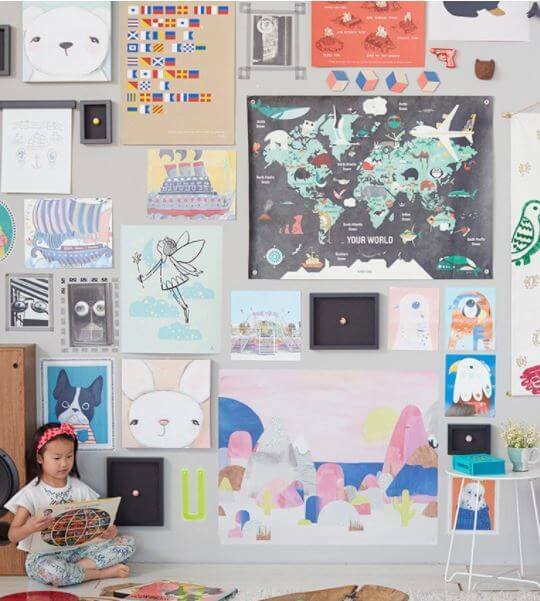 Make a gallery wall with a mix of kid’s art, family photos and other mementos. We have a variety of accessories and picture framesOpens in a new window to ensure you capture the right decor and style. Installing wall shelves is an attractive and practical way for your kids to show off keepsakes. As an added bonus, the shelves provide a space for all those toys, books and other items and keep them off the floor. 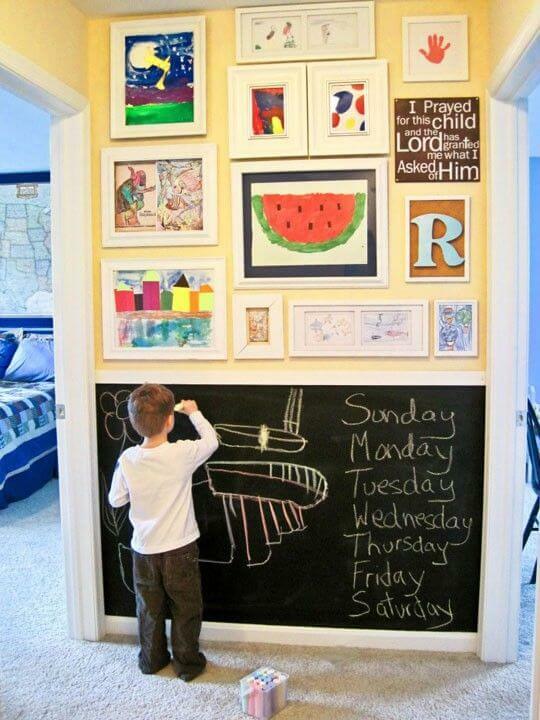 In recent years, painting walls with chalkboard paint has become trendy, especially in a kid’s room. No idea is too big with a stick of chalk and an endless imagination, and clean up is easy. You’ll see your kid making some big changes during their teenage years. They’ll be exploring their identity and trying different styles that will surely be reflected in their bedroom. It can still be a chic destination after school, though, by adding appropriate teen room wall decor. Bold statements on the walls mixed with fun, quirky art can empower your future girl-boss with a strong sense of self-esteem and self-worth. If your teenager has a penchant for sports, what better way to express that than with some fun canvas art? No matter what their go-to activity is, these action shots will surely inspire them to keep moving. Go to your local craft store, and pick up peel-and-stick cork. 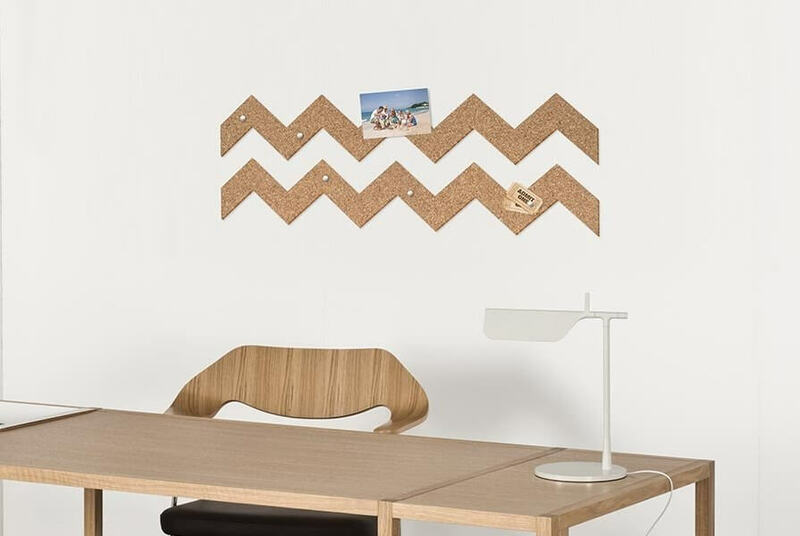 Cut it into any shape and apply it to the wall for a quick and creative DIY. Use it to pin photos, reminders, to-do lists and so much more. 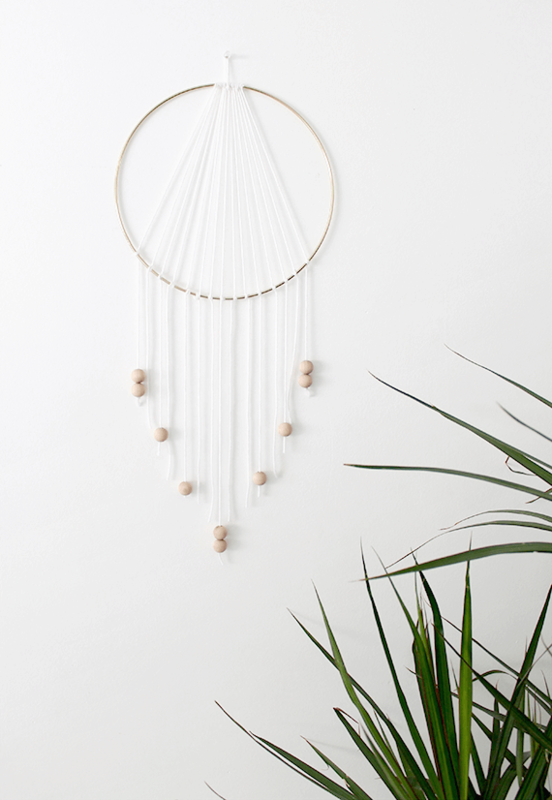 Dreamcatchers are a stylish way to embody happy sleep and general feel-good vibes. 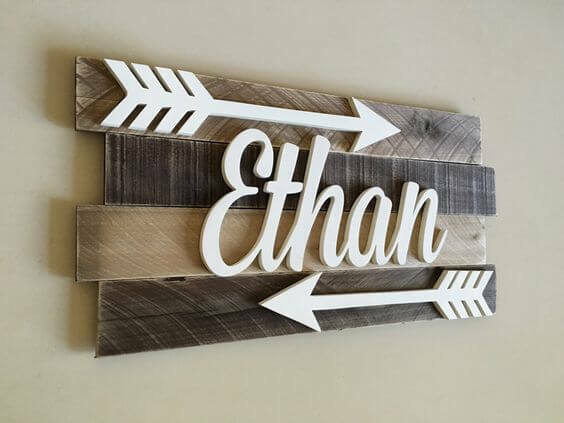 They’re relatively easy to make, so whether you or your teen would like to create one, it’s a trendy decor item they’ll love. 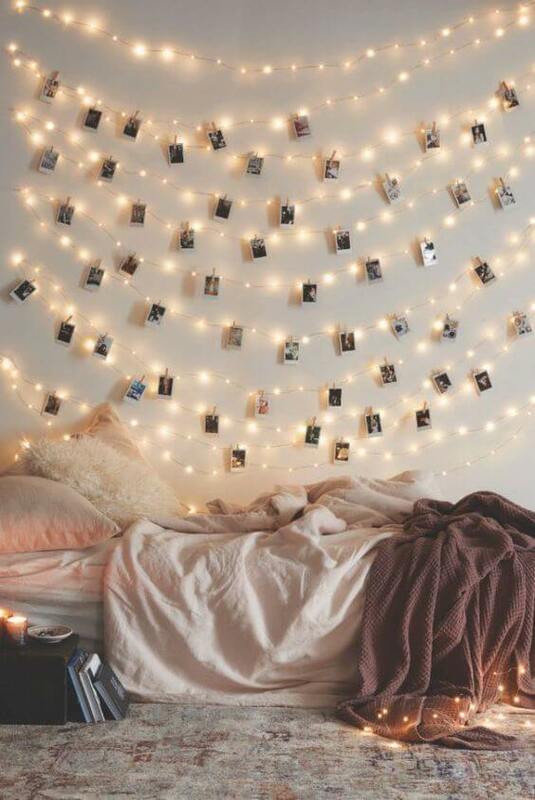 Stringing fairy lights over your teen’s bed is a gorgeous complement to their decor. Along the lights, they can use clothespins to hang polaroids to showcase great memories, too. As fun and exciting as it can be to watch your kids grow, it’s a challenge to design bedrooms that grow along with them. Creating exciting wall designs for kids rooms are fun, cost effective ways to refresh their rooms, no matter what their ages. Which of these kids wall decorating ideas are your favorite? Do you have a room you’d like to share? Let us know by using the hashtag #MyAshleyHome for a chance to be featured. Move over hyggeOpens in a new window. There’s a new trend in town. If you haven’t heard of wabi sabi, you’ll probably look at the name and say, “What in the world is that?” Don’t worry. Chances are you’ll fall in love with it after reading this. Wabi sabi is an ancient Japanese philosophy focused on finding beauty in imperfection and not just accepting, but celebrating the beauty found in age. It’s rooted in Zen Buddhism and was first introduced in the 12th century, where priests and tea masters incorporated the concept of simplicity into the tea ceremony. Instead of striving for perfection, they used irregularly shaped bowls and broken cups. In fact, broken cups would often be mended using gold fill to highlight the imperfection. Translating that ancient concept into today’s culture means appreciating every wrinkle and unfinished surface in furniture and decor. Here’s how to nail the wabi sabi trend in your home. Materials such as natural metal and wood work best for wabi sabi. We suggest choosing pieces that have hand-crafted appeal. Look for characteristics such as the nicks and dings in uneven wood grain. Go for metals that have an oxidized look. This is where you can really have fun mixing and matching pieces. Perfection is the least of your worries. The idea of an unmade bed with wrinkled sheets may be scary for some, but it is valued in wabi sabi. Forget perfection. 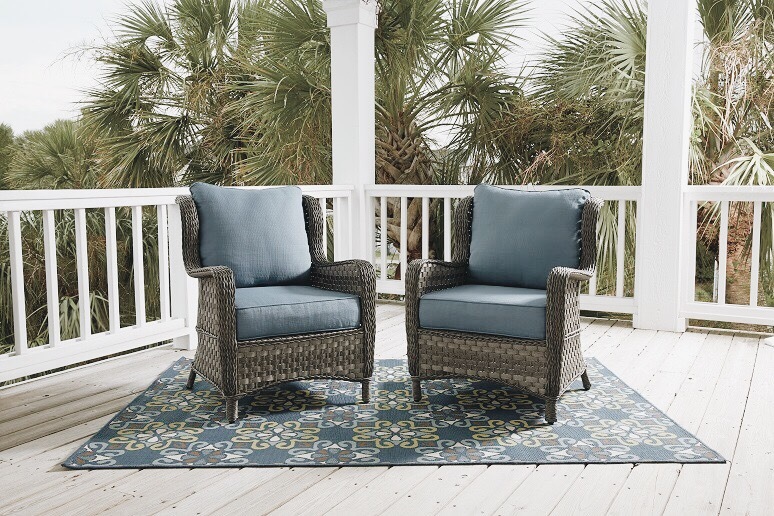 Celebrate the human touches that add a comfortable, lived-in feel to your home. In the living room, a slightly wrinkly throw on your sofa does the trick. Authenticity is key as we move from indoor to outdoor. Teak is a great material to utilize when living the wabi sabi lifestyle. It ages naturally into a gorgeous patina gray without rotting or warping. It’s also insect infestation-resistant, so you’ll enjoy its beauty for years to come. When it comes to the patio, embracing fallen leaves is also encouraged. There is no need to hurry and sweep them away. It’s all about appreciating each stage of their color-changing process. 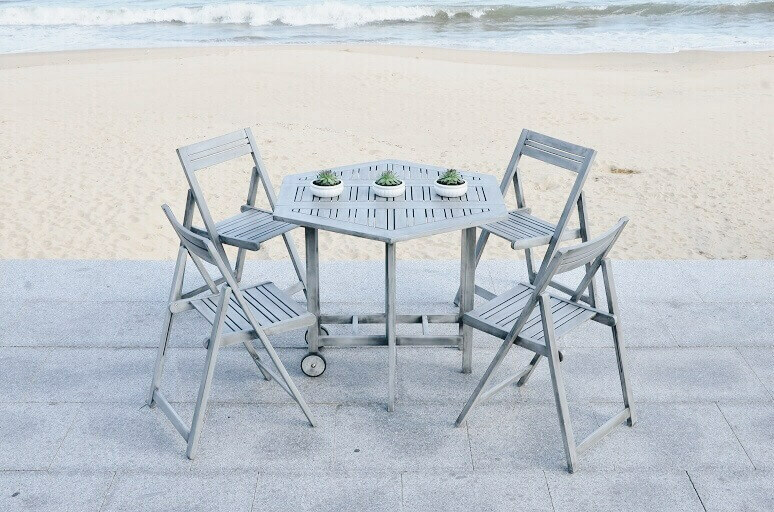 Wabi sabi welcomes the simpler things in life. Feel free to use less decor and allow your furniture to be the focal point. There is beauty in negative space. Sprinkle in greenery and handmade vases or bowls for added style. Soft colors, natural hues and understated textures work well for the aesthetic you wish to achieve. Remember, home doesn’t have to be perfect. It just has to be comfortable. Want a chance to be featured on our blog posts? 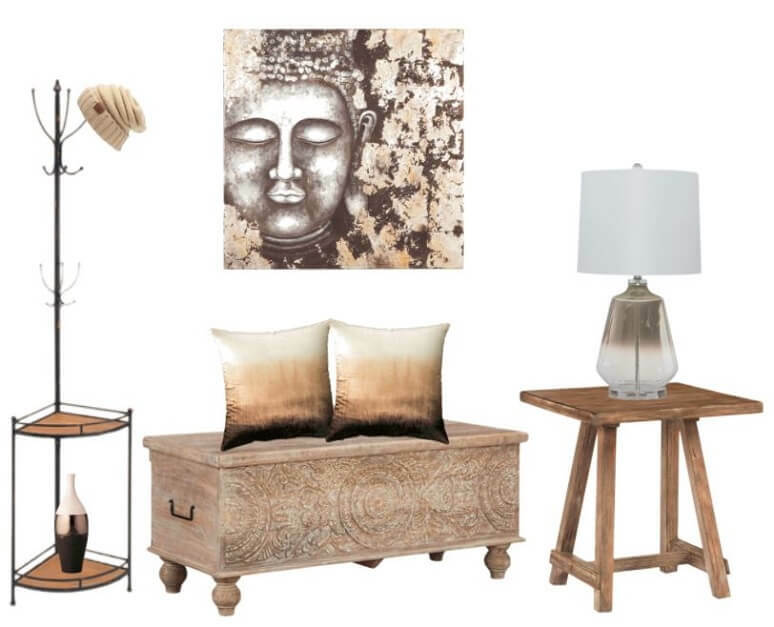 Share with us how you wabi sabi your home, using #myashleyhome on social media. Never have your Furniture stained again. Here’s 4 Reasons on why Nuvella Fabric is fully supported by Ashley Furniture HomeStore as the future of fabric!